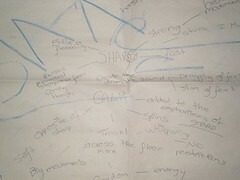 This is a score that I created from the workshop with the artists from the Siobhan Davies dance company as part of project week. We were given a short poem as our stimulus and from this I chose the words sharp and calm to work with. They are two contrasting words and therefore created two very different types of movement. When I combined the two together, I discovered that they helped to emphasise the sharpness and calmness of each other.